Our new Intern , German Alena Bieling, a student at Thomas More University College, brings us news from the Euractiv Event of January 23. High quality media is under pressure all over the world. Challenges such as growing digitalisation, fake news, hostility to the media, and the decline of traditional financial schemes have made it inevitable for media to find new ways to survive. On a EURACTIV conference on January 23, Commissioner Mariya Gabriel says the European Union urgently needs to react to these developments. Among the solutions discussed: actions to combat disinformation, media literacy, Commission action to tackle media ownership problems and a network of European foundations to make it easier for media outlets to find investors. 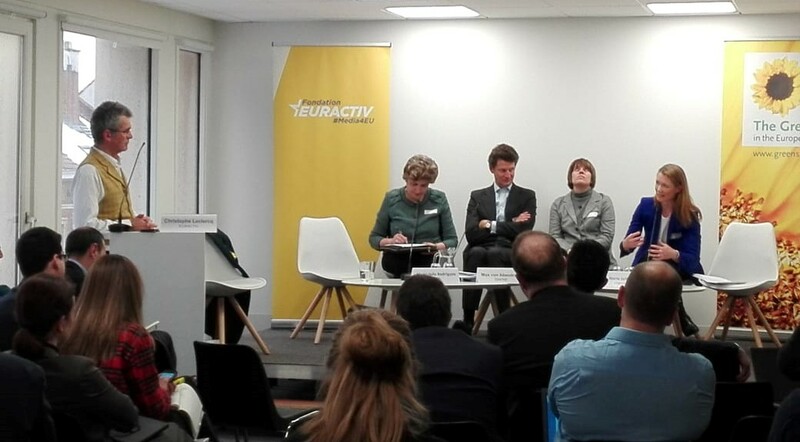 On January 23, the Fondation EURACTIV together with the Greens/EFA group organized an interactive conference entitled ‘Can the EU do more for a healthy media sector?’. The event was attended by officials from the European Commission and Parliament, as well as several academics and rights activists. Jávor Benedek, MEP from the Greens/EFA Group, gave his view on the nature of the challenges facing the media. “There is the need for a joint effort by the Commission, the Parliament, and European media outlets, as well as for public pressure from each of us to push the EU to be more active. Because without press freedom, there is no democracy, and without democratic states, there is no European Union,” he said. All of the speakers on the panel pointed out that there is a trend whereby the general public in the EU is becoming more hostile to the media and societies in the EU are increasingly polarised. This hostility and polarisation are being fuelled by many European governments and politicians. More worrying still, there is growing political pressure on journalists and media, including incidents when journalists are being threatened, intimidated, and even killed. All speakers on the panel agreed that the EU can and should use all its powers to safeguard a healthy media sector and that there is an urgent need to develop a new action plan for the media, including adequate financial support mechanisms. “It is time to act and to renew the role of media in the EU, to decide for a clear European strategy concerning the relationship between the EU and the media and the role that the EU can take in securing a healthy media sector,” said Benedek. What is being done by the EU? The EU’s Commissioner for Digital Economy and Society, Mariya Gabriel, said that the European Union urgently needs to react to the various challenges facing the media. She pointed out that the European Commission is heavily involved in fighting disinformation, especially regarding the context of the upcoming European Parliament elections in May. In September 2018, a code of practice against disinformation was adopted. Compliance to the code is voluntary. Signatories who have agreed to comply with the code include traditional media and social media organisations such as Facebook and Twitter and the internet search engine Google. The code includes a self-regulatory approach via which signatories have agreed to measure their progress in the fight against fake news. Commissioner Gabriel revealed that a first report on the findings of this self-regulatory approach will be published in the upcoming week during an event on January 29. The European Commission has also increased its budget for specific support mechanisms concerning media freedom, pluralism, and media literacy by 30% (to 61 million euro). The money is being used to ensure that each citizen can access quality media and to mitigate the effects of the digital transition and the developments of digital media. Critical voices during the penal session argued that this budget is insufficient to cover the costs of securing press freedom for the upcoming years, especially given claims that the EU media sector has a shortfall of around 9 billion euros in business revenue. The media sector across the EU is facing many financial challenges, including due to the ongoing transition from the printed publication of news to a digital one, platformization (the rise of the platform as the leading economic and infrastructural standard of the social web), and challenges due to market distortions relating to actions taken by governments and private owners. “Apart from information inequality (governments giving information only to selected media outlets), media outlets in many European countries are losing their financial independence and transparency by being bought out by oligarchs,” said Ágnes Urbán from Mérték, a Hungarian media monitoring body that is committed to press freedom and to freedom of expression. Benedek argued that “the European Commission has very strong competences in the single market through which it can and should address ownership problems”. Ides Debruyne from the Journalism Fund, an independent non-profit organisation whose purpose is to stimulate in-depth, cross-border journalism in Europe, added that the EU could also help by setting up a network of European foundations to make it easier for media outlets to find investors. Marie Sellier from the French media conglomerate Vivendi concluded that the EU needs an own industry (or innovation) policy for the media sector which is focused on data competition, diversity, pluralism, and fighting illicit content.